Avingard had been traveling along the road from Whiterun to Solitude for most of the day. He had seen and battled more bandits than he cared, and came face-to-face with the Thalmor. Now the sun was beginning to set in the sky, and Avingard needed a place to rest if he wasn’t going to make Solitude this day. As he walked along the road he notice a large stone structure in the distance. As he came closer he notice that it wasn’t just a structure it was a bridge with a large stone dragon’s head in the middle looking down at those crossing the bridge. He had heard about the bridge, which is called Dragon Bridge, from his father, and it was a very strategic bridge for both the Stormcloaks and the Imperial Legion. 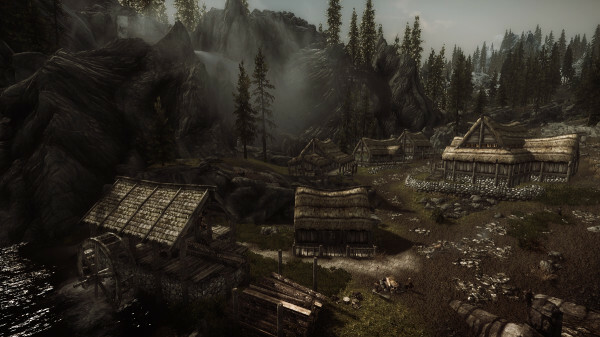 Next to the bridge is the town of Dragon Bridge, which has a few townsfolk, who have been worried about the civil war as both sides have thought about destroying the bridge to prevent the other side from crossing. As the sun continued to set, Avingard decided to rest in Dragon Bridge for the night and continue on to Solitude in the morning. In the distance, to the north, Avingard can see the large buildings of Solitude against the darkening sky. While it seemed his destination was fairly close, traveling at night in an unknown location could be a dangerous idea, so waiting until morning was best. As he walked through the town, Avingard eventually spotted what he had been looking for – a tavern. The Four Shields Tavern was the largest building in the town, and looked like the perfect place to spend the night. He opened the door and entered. The tavern consisted of a large room with tables on either side of a long fire pit. Along the far wall was a bar area, which was tended by a Nord woman. Avingard was the only patron in the tavern at this time. He walked over to the bar and greeted the Nord womam. Faida walked out from behind the bar and towards a door to the right of Avingard, who followed closely behind her. “Let me know if there’s anything else you need,” Faida explained to Avingard who was busy putting his sword down. Avingard thanked Faida, who then left the room to return to tending the bar. After removing his armor, Avingard laid down on the bed and thought about all that had happened today. He was also thinking about what he can expect tomorrow when he finally would reach Solitude.